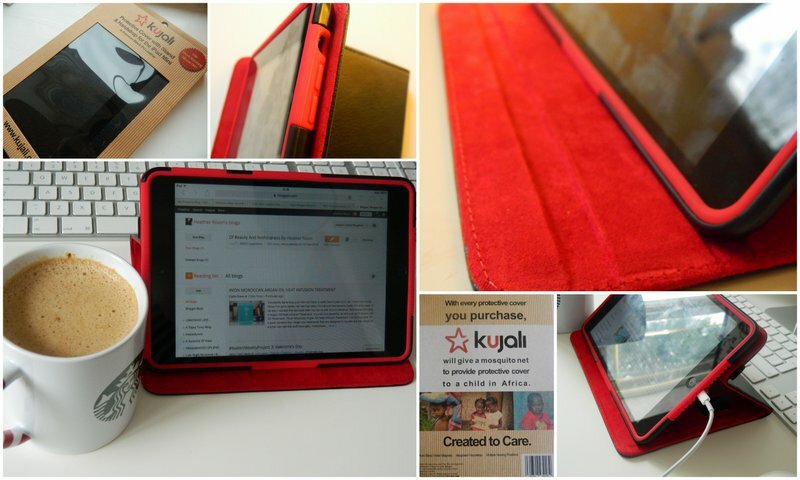 I was very kindly sent this *iPad mini case by Kujali about a week ago - this does not affect my opinion of the brand/product, for more information about PR and my disclaimer, click here. I was in need of a new ipad case and this one sounded very interesting, especially as with every purchase of this case, the company will give one mosquito net to a child in Africa which is just fantastic! Also each case is tested for months before it is released so you know it is going to be amazing! The *Kujali iPad Mini Case is priced at £29.99 which for the incredible quality and charitable actions of the brand is an amazing price. The case has a matte black leather outer cover and the inside is a plush red suede material - I love the contrasting colours. There is a red silicone lining that adds very good protection. To insert your iPad Mini, you just remove the padding and red silicone lining. Then insert your ipad mini in the red silicone lining before you fit it into the hard black case. The fit is snug and I feel like it will definitely keep my iPad mini as protected and safe as it could possibly be! The silicone is shock absorbing. There is a slot for the lightening charging cable and raised areas where the power button and volume buttons are. The silicone doesn't affect the effectiveness of the buttons. The case is held closed by a elasticated black band and the plastic case holds the ipad really well all over but especially at the corners. The case has an elasticated band on the inside so you can place your hand inside to hold the case. Also the case has groves on one side so you can stand it up at different angles which is the main way I use it - it is very useful, it is one of my favourite features. There is a hole for the camera on the back and I feel like my ipad is very secure and protected, even if I drop it (which I have done a couple of times...oops!). Also if you register your case online with Kujali, they offer a lifetime warranty on the case. Overall, I am extremely pleased with the case, it works so well and aesthetically I think the case looks very sleek and expensive and in terms of functionality I cannot fault it. I will be using no other case as long as I have this one. I also love the charitable aspect of this product/brand, with every purchase of this iPad mini case, the company will give one mosquito net to a child in Africa to try and reduce deaths related to malaria. I am recommending this case to all of my friends and family who have iPad minis, I love it! I cannot recommend this case and brand enough, for more information on the case and charitable work, click here. I have one for mine too! This looks like an amazing Ipad case. The contrast of colors is really great. I have a similar,but pretty boring one (the original case by apple),but i think this one looks so much better. Might even be a bit better as one corner of my Ipad always slips out of my case. Do you know if such a case as yours is also available for a normal Ipad? Lovely little case! It's nice to see that they help in Africa too :) Makes a change from most other competitors. Such a nice case... now I just need an iPad to go in it! Haha. Enjoy for all using those ipad cases. I also like to use.